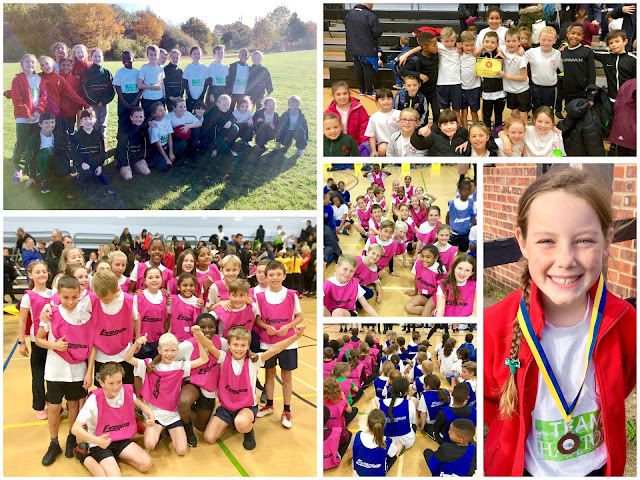 November was a busy month for Hacton's athletes, with the Havering Cross Country and Sportshall Athletics competitions both taking place. First up was the cross country. A bright, sunny morning greeted our 24 pupils at Stubbers Activity Centre, making their long run that little bit easier. The event began with the Year 3/4 girls' race. Our 6 girls lined up along with approximately 160 competitors from other schools, ready to run 1.2km through grass and woodlands around the lake. Next up was the Year 3/4 boys race, followed by our older pupils who tackled a longer 2km course. All of our pupils - some who have participated before and others who joined the team for the first time - ran absolutely brilliantly, pushing themselves and persevering when the race got tough. A special 'well done' to our two Year 6 pupils who achieved top-10 finishes. Congratulations also to our talented Year 4 pupil who finished in a fantastic third place, becoming Hacton's equal-highest all-time finisher! November ended with the Sportshall Athletics competition at Hornchurch Sports Centre. Day 1 saw 20 of our Year 5/6 pupils participate in a range of running, throwing and jumping events, competing against 17 other schools. All of the events were relays, so good teamwork and changeovers were very important. The children did fantastically, winning their heat in 8 out of the 12 races, coming 2nd or 3rd in the others and supporting each other enthusiastically. At the end of the competition, there was a tense wait for the results... were thrilled to find that we had won! Although a school from the afternoon session (18 schools participated in the morning, and 18 in the afternoon) won the overall event on points, all of our pupils should be very proud of their achievement. The next morning was the turn of our Year 3/4 pupils, many of whom were new to Sportshall Athletics. Again, the children did a fantastic job, changing their baton skillfully and demonstrating some excellent throwing and jumping. After a busy and tiring morning, we were again delighted to find out that we had come an excellent third out of 16 schools! Congratulations and thank you to the 42 children who represented Hacton in these events. We would like to say a special thank you to our talented Year 6 pupils, many of whom were competing for the last time after many years: you have been such great competitors and wonderful role models to our younger pupils.